You know those times when you have a great idea pop into your head and then for some reason you just can’t get it to work? Me too. Today’s post is not one of those, which is why I’m so excited to share this idea with you. I absolutely love Haniela’s Lego Brick Piñata cookies that she shared as part of our Lego blog hop last month and it hit me, if you can put candy inside of cookies, why not inside of cupcakes? 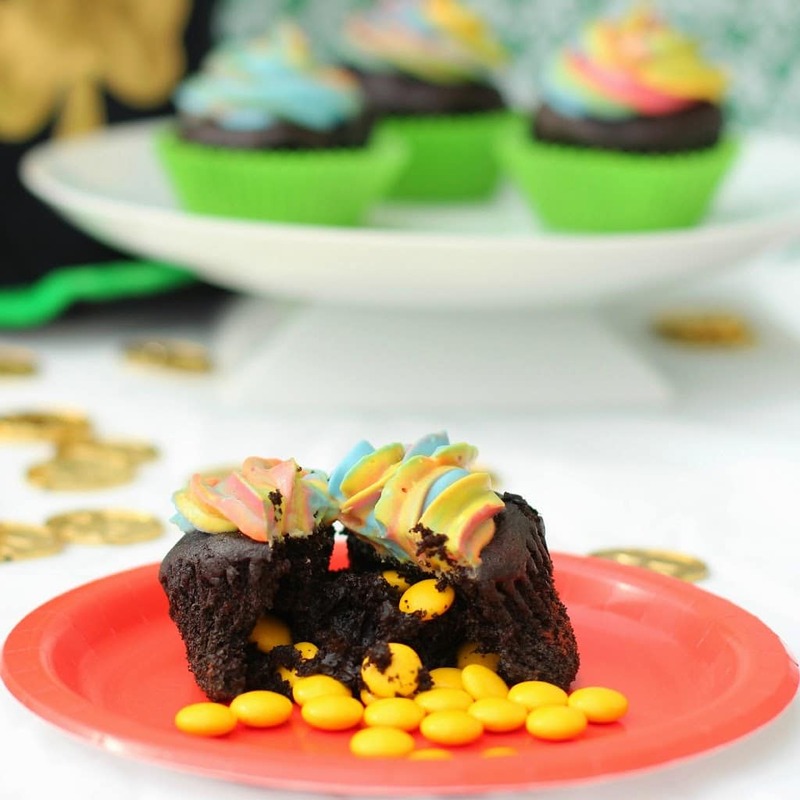 And that’s how the idea for these St. Patrick’s Day Pot of Gold Cupcakes was born and for one of the first times, they turned out exactly like I envisioned them. I’m pretty sure you would be the coolest mom ever if you brought these to your child’s classroom St. Patrick’s Day party (do they have those???). I mean, how awesome would it be to see the kids take a bite and realize that there are actually gold coins inside. Or you could even just take them to a St. Patrick’s Day party with your friends, really who doesn’t love a good surprise. And Reese’s Pieces, which is what I used to fill these with. Step 1: Make your favorite chocolate cupcakes. Before you bake them, add black (yes I said black) food coloring to the mixture to make black cupcakes. You’re making a pot of gold after all and pots of gold are black. Once the batter is black, bake your cupcakes and let them cool just like you normally would. After the cupcakes are cooled, core the middle of the cupcakes about halfway down. I made the mistake of coring almost to the bottom of the cupcakes, and then they wouldn’t stand up when I cut them in half because there wasn’t enough cupcake underneath the candy still being held together. Step 2: Fill the cupcakes with yellow candy and put the core of the cupcake back on top. 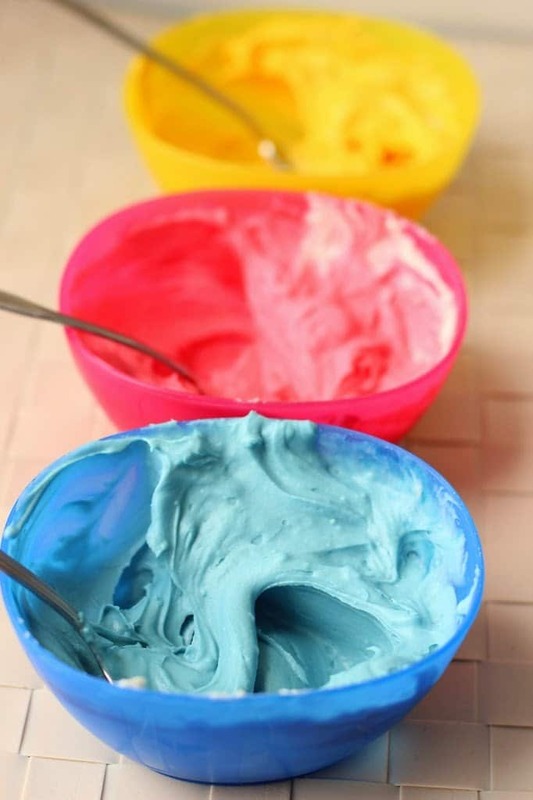 Step 3: Make rainbow frosting. 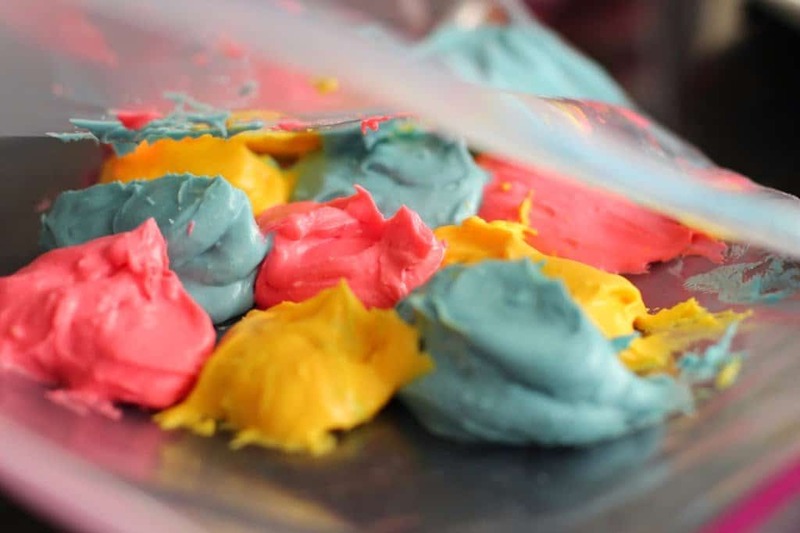 I used these instructions (sort of) but basically all you have to do is make three (or more) different colors of frosting and then scoop the frosting, alternating colors, into the piping, or Ziploc in my case, bag. Then when you pipe out the frosting it combines to give you the awesome rainbow look. It’s a little confusing when written out so hopefully the pictures below will help. 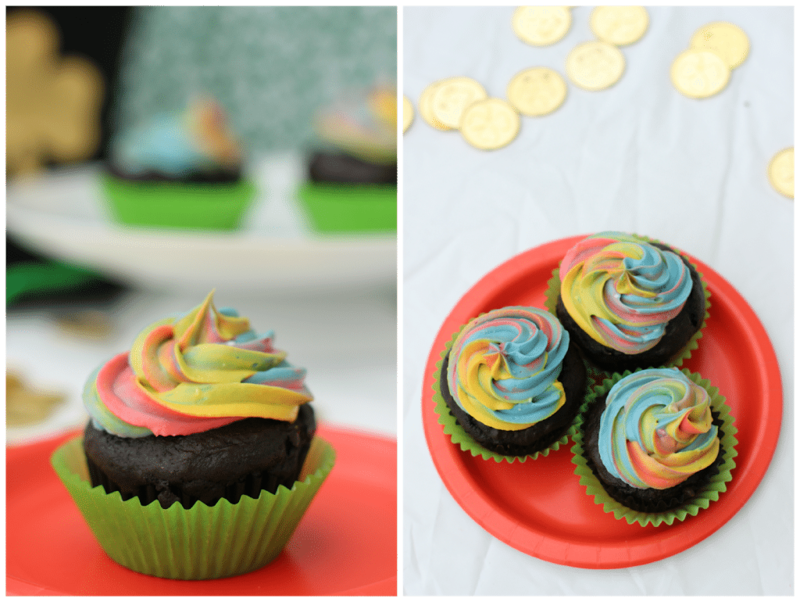 Once your frosting is done, pipe swirls of rainbow frosting on top of the filled cupcakes. Step 4: Eat! And enjoy watching everyone’s surprise as they take a bite of the cupcake and get a couple of Reece’s Pieces at the same time. Who knows, maybe there is a pot of gold at the end of the rainbow after all. 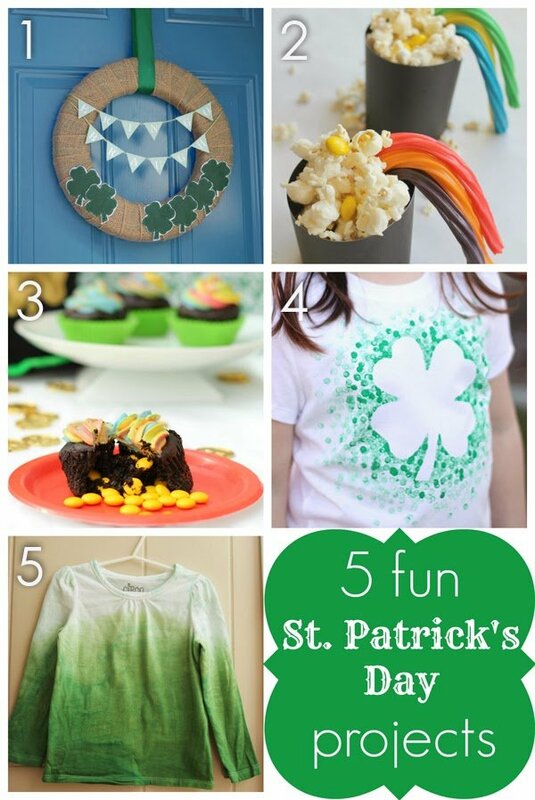 Want more fun St. Patrick’s Day ideas? This post is part of St. Patrick’s Day hop with four other awesome bloggers. Make sure to stop by and check out all of the other fun ideas. 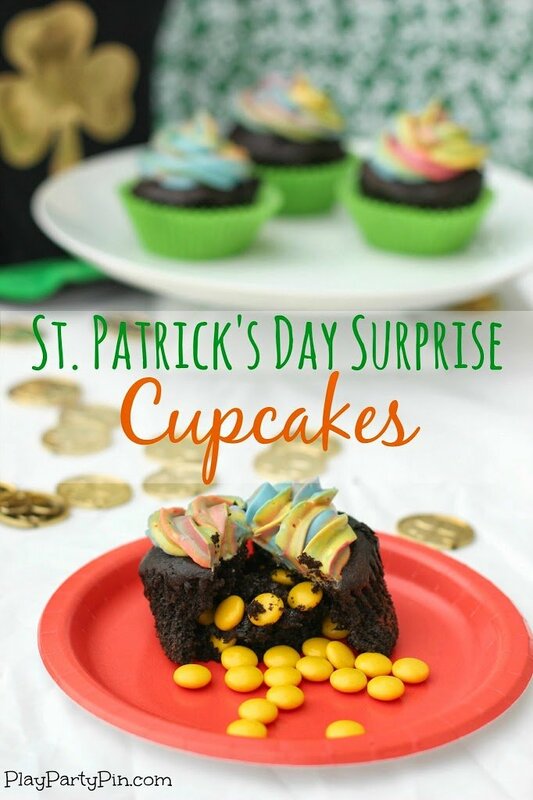 3) St. Patrick’s Day Surprise Cupcakes by Play. Party. Pin. What a cute idea! Love it! Just pinned! Cleaver! I also like that twizzler rainbow with popcorn. Me too Jeannie, but that might just be because I love Twizzlers! Such a cute idea! I seriously love everything about these!!! How fun! I love the “gold” center, and the frosting is super cute! I have tried mixing the frosting like that before and mine was NOT as cute as yours for sure! Thanks Bethany! I was actually really surprised that the frosting turned out so cute, especially since I’d never done it before. These are great, Britni! They turned out so well! OK, I love how you made that rainbow frosting! How clever. My kids would go crazy over these, they are adorable. I love these! What a great idea. I can’t wait to make them for my family. visiting from Lakeshore drive linky..and OMG am I going to make these for my grand kids next month! THanks for sharing! How fun! I love anything with a surprise inside! I always wondered how the M&Ms got in there and didn’t melt. now I know! Such a fun idea! Thanks for sharing on Found & Foraged! 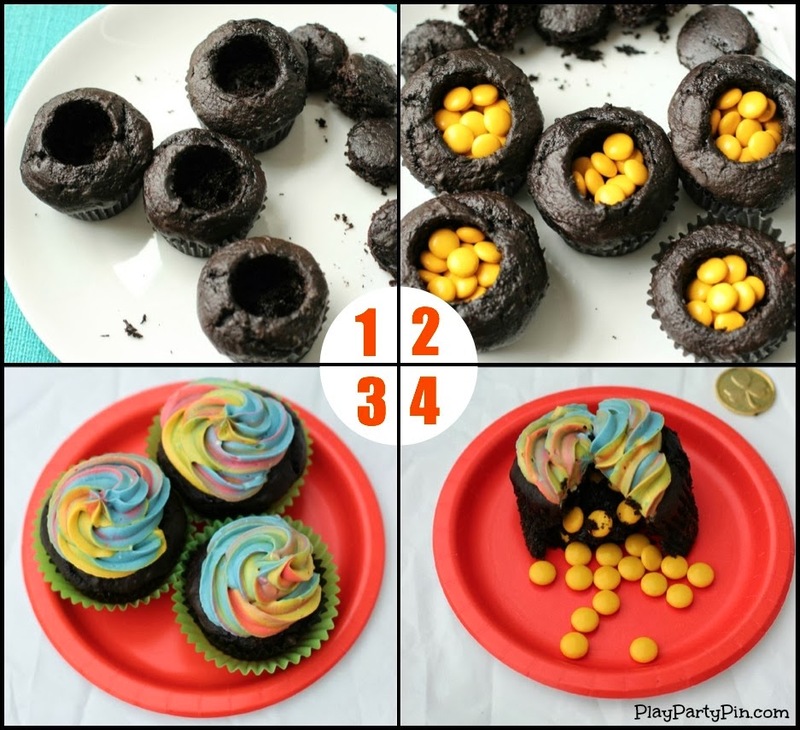 What a clever cupcake idea- how fun these would be for dessert! Kids are going to love these cupcakes!!! I love this cupcake! Thank you for sharing on Show Me Saturday!